Areas in red declared in drought emergency. 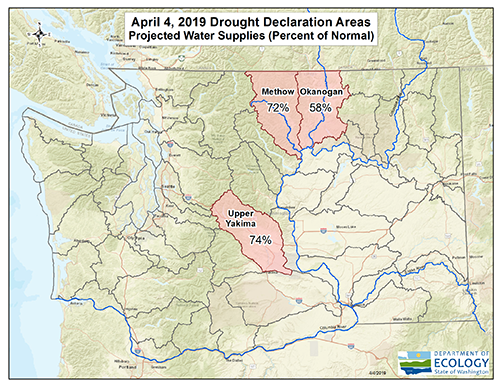 OLYMPIA – Despite significant snow in parts of Washington, water supply shortages are projected in the Methow, Okanogan and Upper Yakima basins, prompting Gov. Jay Inslee to declare a drought emergency in those watersheds. The Washington Department of Ecology forecasts summer water supplies using data from state and national agencies. The Methow is projected at 72 percent of normal, while the Okanogan is expected to be 58 percent of normal, and the Upper Yakima at 74 percent. The areas declared in drought emergency are prime agricultural regions and stand to lose valuable crops if faced with water supply shortages this spring and summer. Ecology has been keeping a close eye on water supplies in North Central Washington throughout the winter, said Director Maia Bellon, and felt it was important to start preparing for potential shortages as soon as possible. “By declaring a drought emergency, we can offer vital support to these communities. We also empower our partner state agencies and local conservation and irrigation districts to provide a range of emergency services,” Bellon said. The coming months are forecast to be warmer and drier than normal, putting more areas at risk. Bellon, the official water supply manager for the state, will continue to closely monitor watersheds of concern such as the east slope of the Cascades and the Olympic Peninsula. The Washington State Department of Agriculture advises growers to prepare and plan for limited water supplies. Many high-value crops such as apples, berries, pears, cherries and wine grapes could be at risk. Ecology is requesting $2 million from the state Office of Financial Management for drought response programs. This could fund projects like installing emergency facilities; providing water leasing; and supporting operational changes to move water through tributaries and support salmon survival. Washington is projected to have more frequent droughts as the climate warms. To proactively meet the needs of the state’s rural communities, farmers and fish during droughts, Ecology has asked the Legislature to modernize the state’s decades-old drought laws. The latest information on water supply conditions is available on Ecology’s website at ecology.wa.gov/drought.